Finding the car battery you need couldn't be easier. If you know the part number, simply search for it using the search bar below. If you do not know the part number, input your car details in the fields available. If you have any questions or still can't find the right battery - do not hesitate to get in contact. 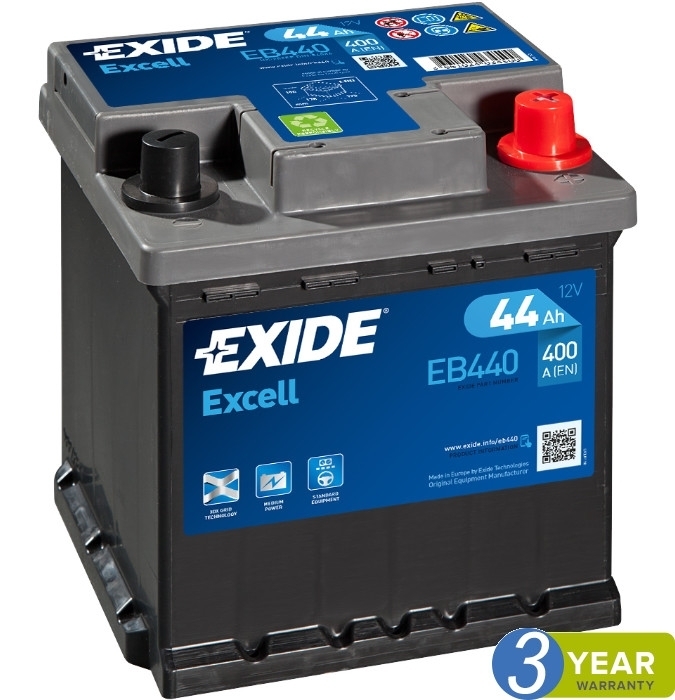 The proven Exide Excell battery is an all-rounder for most modern vehicles, standard equipment and everyday driving. 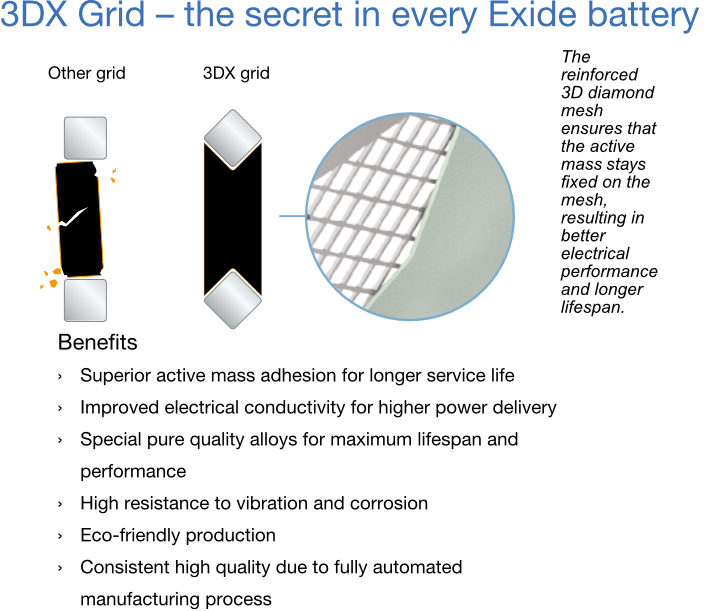 As every Exide battery, the Excell battery also features the robust 3DX grid technology for better electrical performance and longer lifespan. The unit of measurement of current flow. One volt placed across a one ohm resistance will cause a current of one Amp to flow. One amp for one hour is called an “amp-hour” or Ah. 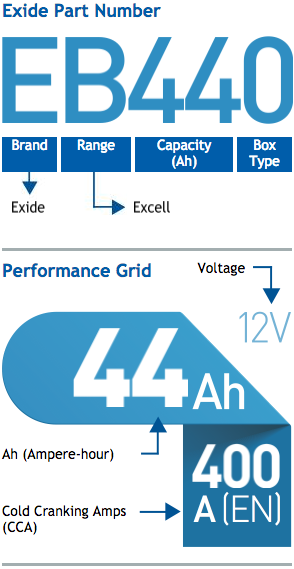 Ah is an indicator of the total energy the battery can store and deliver at its rated voltage. Current multiplied by time in hours equals ampere-hours. A current of one amp for one hour would be one amp-hour. The Ah performance rating of automotive batteries is measured over 20 hours of discharge, so a current of 3 amps for 20 hours would be 60 Ah. The CCA is an indicator of the power the battery can deliver for engine start. Consequently, bigger engines usually require higher CCA values to operate. CCA is measured in Amperes under normalised conditions (discharge at -18ºC, keeping battery voltage over a minimum value) according to the standard EN50342-1. All modern conventional cars use a 12V battery consisting of six cells of 2V per cell. 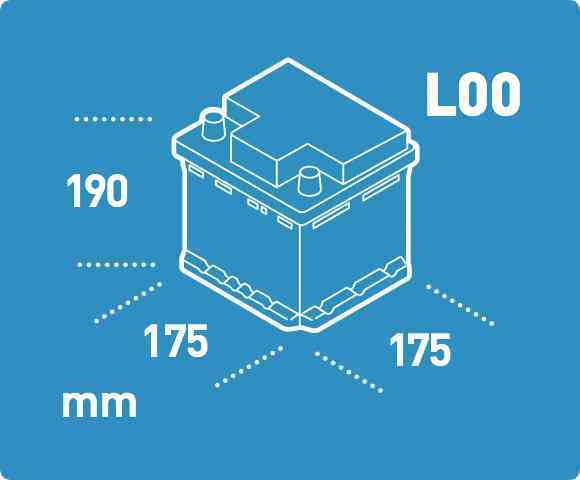 For other applications lead-acid batteries are also available in 6V.